1. Dark Sky ( #iPhone & iPad ) – Dark Sky is one of the best weather apps for iPad and iPhone, that helps users by sending push notifications about your local weather. The app will notify you before it starts raining wherever you are. Great app that can help you to get exact weather information. Dark Sky uses GPS to give your minute to minute weather predictions of your local area. Dark Sky comes with some useful and unique features which can only be found in few apps. 2. Weathercube Gestural Weather ( iPhone & iPad ) – Weathercube is a simple, easy to use and powerful weather app that helps users to get weather information about 1.7 million cities of the world. The app has very nice user interface and it comes with multiple languages & colorful themes. You can personalize the app to get weather information of your local area in your local language. 3. Today Weather ( iPhone & iPad ) – Today Weather is a useful weather app that helps you get useful weather information of your city. With Today weather app, you can view 7 day forecast, get hourly weather details, sunrise , sunset times , check radar , add location to view weather snapshots etc. Today Weather app has beautiful user interface and comes with lots of useful options. You can also share weather report to your friends via Facebook , Twitter etc. One of the most useful weather apps for iPhone and iPad users. 4. The Weather Channel ( iPhone ) – Beautifully designed weather app for iPhone . You can get weather information quickly from your iPhone. The app has very nice users interface that shows you weather reports with beautiful nature images and animations. 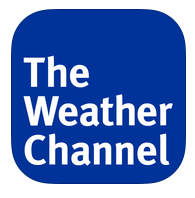 The Weather Channel shows you accurate weather results with a solid look. The app comes with lots of useful options which allow you to track and manage unlimited locations of the world, get current weather conditions, view 15 day forecast, wind speed and direction details etc. Recommended app for iOS users. 5. Yahoo Weather ( iPhone & iPad ) – Yahoo Weather is a popular free weather app to find weather details of your favourite locations. Yahoo weather app comes with beautiful photos that can match your location, current weather reporting tool, forecast viewer, radar, sunset and sunrise times etc. If you are looking for free weather app for your iPhone or iPad, you can install Yahoo weather app on your device. 6. 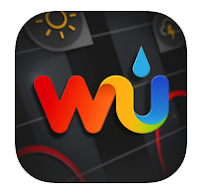 Weather Underground ( iPhone & iPad ) – Weather Underground is one of the best weather apps that are available free of cost. This app helps you gather weather report of almost all popular places with more than 180000 personal weather stations. Featured rich app that also supports apple watch and it comes with several features such as current weather condition of local stations, all types of temperature data including wind speed, comparison of weather with historical data, air quality monitoring tool and many other functions. Very useful weather app for iPhone & iPad.